PFLAG Albuquerque promotes the health and well-being of gay, lesbian, bisexual and transgender persons, their families and friends through: SUPPORT, EDUCATION and ADVOCACY.
. LGBTQ(+) SCHOLARSHIPS for new college students! 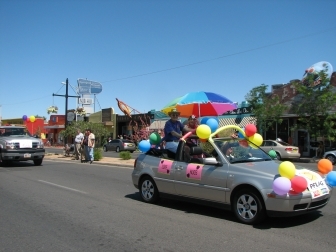 Click "News"
Pride PFLAG car, "hugs" truck. Meetings are on the third Wednesdays of each month. Our meeting place is on the south side of Central Ave, two stop-lights WEST of San Mateo Blvd.<google map> 136 Washington Street, suite E. Washington Street is well-marked, on Central. There is ample off-street parking. 2019, May 15th. To be announced. 2019, April 17th. Maria, from the LGBTQ Resource Center, explained the Center's mission, services and activities. The LGBT-RC is on UNM's Main Campus (1919 Las Lomas Road) across from the Yale parking structure which is north of the Duck Pond). 2019, March 20th. Alex M. said "We [celebrated] spring with a little bit of swing [dancing]." Several who Know How showed us How to Swing. We began our meeting with support/conversation, as usual. 2019, February 20th. -- We celebrated our Pals with craft-work, "Palentines," to take home or to distribute locally. We began with support/conversation and snacks. 2019, January 16th. -- Chris Topher, a guest known to many of us, led us in team-building activities and exercises that helped us learn to better serve our community. It's 2019, and we look forward to it being a really great year! Previous year calendars are in NEWS ARCHIVES below.